Build your savings automatically — free Kasasa Saver® connects to your equally free Kasasa Cash® or Kasasa Cash Back® checking to help you maximize your rewards. Each month you meet the easy qualifications in your Kasasa Cash or Kasasa Cash Back account, your earnings automatically transfer into Kasasa Saver. Plus, your Kasasa Saver account earns a high rate of interest! It's a powerful new way to build your savings with ease. That's it! No problem at all. Even if you don't qualify to earn your rewards during the monthly qualification cycle, your Kasasa accounts are still free — plus, you'll still earn our base rate of interest on Kasasa Saver! And you can get right back to earning your rewards the very next month. *APY=Annual Percentage Yield. APYs accurate as of 02/24/14. Rates may change after account is opened. Minimum to open is $50 for Kasasa Cash and $50 for Kasasa Saver. 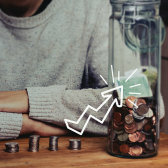 For Kasasa Cash, if qualifications are met each monthly qualification cycle: (1) Domestic ATM fees incurred during qualification cycle will be reimbursed up to $4.99 per single transaction and credited to account on the last day of monthly statement cycle; (2) balances up to $50,000 receive APY of 2.50%; and (3) balances over $50,000 earn 0.25% interest rate on the portion of the balance over $50,000, resulting in 2.50% - 0.45% APY depending on the balance. If qualifications are not met on Kasasa Cash all balances earn 0.5 APY. Qualifying transactions must post to and settle Kasasa Cash account during monthly qualification cycle. Transactions may take one or more banking days from the date transaction was made to post to and settle account. ATM-processed transactions do not count towards qualifying debit card transactions. "Monthly Qualification Cycle" means a period beginning one day prior to the first day of the current statement cycle through one day prior to the close of the current statement cycle. The advertised Kasasa Cash APY is based on compounding interest. Interest earned in Kasasa Cash is automatically transferred to Kasasa Saver each statement cycle and does not compound. Actual interest amount paid may be less than advertised Kasasa Cash APY. The Kasasa Saver APYs may be less than Kasasa Cash APYs. If qualifications in Kasasa Cash are met each monthly qualification cycle: (1) balances up to $50,000 in Kasasa Saver receive an APY of 0.50%; and (2) balances over $50,000 in Kasasa Saver earn 0.25% interest rate on portion of balance over $50,000, resulting in 0.50% - 0.27% APY depending on the balance. If qualifications are not met on Kasasa Cash, all balances in Kasasa Saver earn 0.05% APY. Limit one account per SSN. ATM receipt must be presented for reimbursement of an individual ATM fee of $5.00 or higher. *APY=Annual Percentage Yield. APYs accurate as of 02/24/14. Rates may change after account is opened. Minimum to open is $50 for Kasasa Cash Back and $50 for Kasasa Saver. When monthly qualifications are met, you will receive 2.50% cash back on debit card purchases that post to and settle account during monthly qualification cycle up to a total cash back of $10 per monthly qualification cycle. Domestic ATM fees incurred using Kasasa Cash Back debit card during qualification cycle will be reimbursed up to $4.99 per single transaction if qualifications are met within monthly qualification cycle. Qualifying transactions must post to and settle account during the monthly qualification cycle. Transactions may take one or more banking days from the date transaction was made to post to and settle an account. ATM-processed transactions do not count towards qualifying debit card transactions. "Monthly Qualification Cycle" means a period beginning one day prior to the first day of the current statement cycle through one day prior to the close of the current statement cycle. Kasasa Cash Back rewards will be credited to your Kasasa Saver account on the last day of the monthly statement cycle. If qualifications in Kasasa Cash Back are met each monthly qualification cycle: (1) balances up to $50,000 in Kasasa Saver receive an APY of 0.05%; and (2) balances over $50,000 in Kasasa Saver earn 0.25% dividends rate on the portion of the balance over $50,000, resulting in 0.50% - 0.27% APY depending on the balance. If qualifications are not met on Kasasa Cash Back, all balances in the Kasasa Saver earn 0.05% APY. Limit one account per SSN. ATM receipt must be presented for reimbursement of an individual ATM fee of $5.00 or higher.